In the hydraulic power unit system,the tank is a storage unit designed with enough volume for the fluid in the pipes to drain into it. It's Applying to hydraulic loader, small lifting platform, small hydraulic pump,hydraulic stacker,hydraulic scissor lift platform,disabled vehicle lifting platform,the power unit of airport food car and boarding vehicle,hydraulic van tail board and the dump truck sealing device etc. 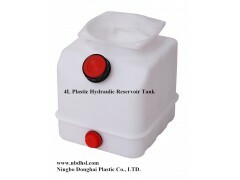 Besides the standard Plastic Hydraulic Reservoir Tanks ,we also customize different oil tanks and plastic products for multiple purpose.